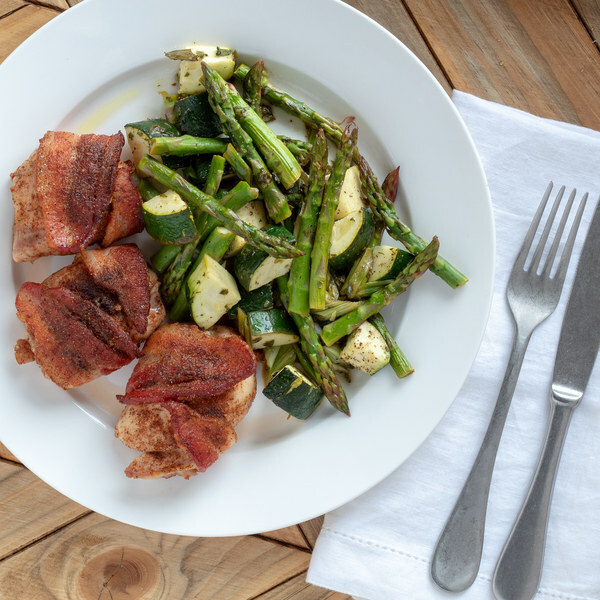 ← Smoky Bacon-Wrapped Chicken Thighs with Roasted Zucchini & Asparagus. In a small bowl, combine chili powder, paprika, onion powder, cinnamon, salt, and pepper. Pat the chicken dry with paper towel; sprinkle chicken with half of the spice blend. Wrap each thigh in 1-2 strips of bacon, place in a baking dish, and sprinkle with the remaining spice blend. Place chicken in the oven and bake until chicken is golden brown and cooked through (internal temperature of chicken reaches 165°F), 20-25 minutes. Meanwhile, wash and dry the fresh produce. Trim off and discard the ends of the zucchini; medium dice the zucchini (cut into ½-inch cubes) and transfer to a medium bowl. Snap or cut off and discard the woody ends of the asparagus; transfer to the medium bowl. Trim off and discard the root ends of the green onions; cut the onions crosswise into ¼-inch pieces at an angle and transfer to the medium bowl. Pick the mint leaves off the stems; discard the stems and mince the leaves. Save some of the mint for garnish and add the rest to the medium bowl. Juice the lemon and add the juice to the medium bowl. Drizzle the vegetables with olive oil and season with salt and pepper; toss to coat, then arrange in a single layer on a baking sheet and place in the oven. Cook until vegetables are fork tender, 12-15 minutes. Remove both pans from oven. Change oven setting to broil and position rack near the top. Return chicken pan to oven and broil until bacon crisps, 2-3 minutes. To serve, divide the chicken and vegetables between plates and garnish with fresh mint. Enjoy!